S’mores Truffles are s'mores like you've never had them before! 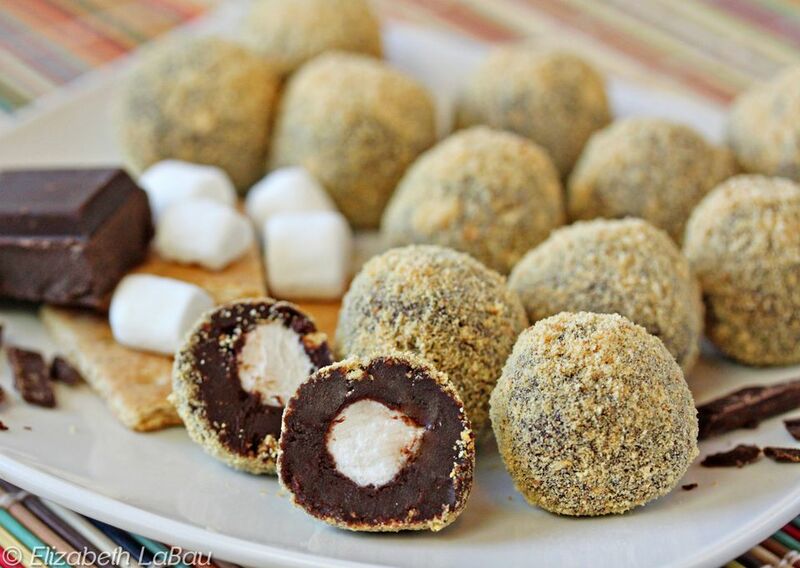 Fluffy marshmallows are covered with creamy chocolate ganache, and then rolled in crushed graham crumbs. They have all the flavors you know and love from s'mores, but in a petite, gourmet package. If you want a more pronounced graham flavor, you can stir a handful of coarsely crushed crackers into the ganache itself. The truffles won’t have a smooth, creamy texture, but they’ll have a greater graham taste and an interesting crunch. Give them a try today! Line a baking sheet with waxed paper or parchment, and set aside. Crush the graham crackers in a food processor until they're in fine crumbs, and place them in a bowl. Put the mini marshmallows in a bowl and set those aside as well. Place the cream in a small saucepan over medium heat and heat it until bubbles being to appear around the sides of the pan and it almost comes to a boil. Pour the cream over the chocolate and allow it to sit and melt the chocolate for one minute. Using a whisk, gently stir to combine the cream and chocolate. Do not stir too vigorously or you will incorporate air bubbles. Continue to whisk until the chocolate is melted and your ganache is shiny and smooth. Cover the ganache with cling wrap and allow it to cool to room temperature. Once cool, refrigerate it until it has the texture of semi-firm cookie dough, about 90 minutes. Set out all of the ingredients (ganache, graham crumbs, and marshmallows). Using a small spoon, scoop up a ball of ganache about the size of a large marble. Press two mini marshmallows into the center of the ball, and scoop out a little more ganache with the spoon, pressing it over the marshmallows to cover them completely with chocolate. This process will be messy, and at first the truffle ball will be misshapen. Drop the truffle into the bowl of graham crumbs. Roll it around until it is coated with crumbs, then pick it up and roll it between your palms until it is round. Roll it once more in the crumbs to get a good coating, then place it on the prepared baking sheet. Repeat the process with the remaining ganache and marshmallows. These truffles can be served immediately, or stored in an airtight container in the refrigerator for up to a week. For the best taste and texture, bring them to room temperature before serving. Click Here to View All S'mores Candy Recipes!